#2 – Kate, commented on January 30 at 5:56 p.m.
#3 – Kiki – commented on Feb 1 at 1:21 p.m. Please send your shipping addresses to hmulder@wecnet.com. Thanks to everyone else who commented. I hope you all know how much I value the feedback and hearing about what aspects of the design that you like. I have had e-mails and phone calls from people looking for the pattern. When I posted the photos, it actually hadn’t been released yet, which is why nobody could find it on-line. I just didn’t want to wait any longer to start posting some photos! Today the samples are going out to our distributors and a postcard will be mailed to the quilt shops on Friday. That means the patterns will start shipping out next week and should start appearing online and in shops shortly after that. For those of you who can’t find it anywhere in your area, you can just drop us an e-mail and we can help you. Many of you asked about the grommets I used and if they required any special tools. Well, some do . . 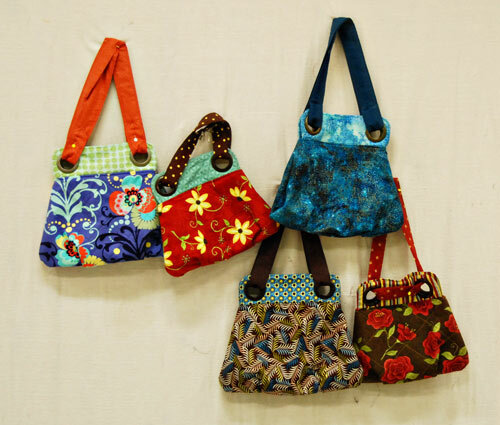 They are available in several sizes and colors. When I had my test class, some brought pretty colored grommets too. I liked the colors, but I didn’t think they were as sturdy as the Dritz Home brand. They were unmarked, so I don’t know what brand they were . . . I just looked on Checker’s website and they have lots of new grommets that I’d like to try, in lots of fun shapes and colors. ( They are different than the colored ones from my test class). As soon as I get a chance to try them out, I will let you know how they work! It’s cute, but the bag needed larger tucks at the bottom to allow for more room within the bag. My second problem was what to do with the ends of the handles. I tried to just tuck the ends under. That turned out to be really difficult and you can see from this picture how bad they looked. I liked the look of this much better and it was much easier to sew. Plus, it’s a chance to show off some really cute buttons! Here’s the first prototype of the larger size bag and convertible handle. 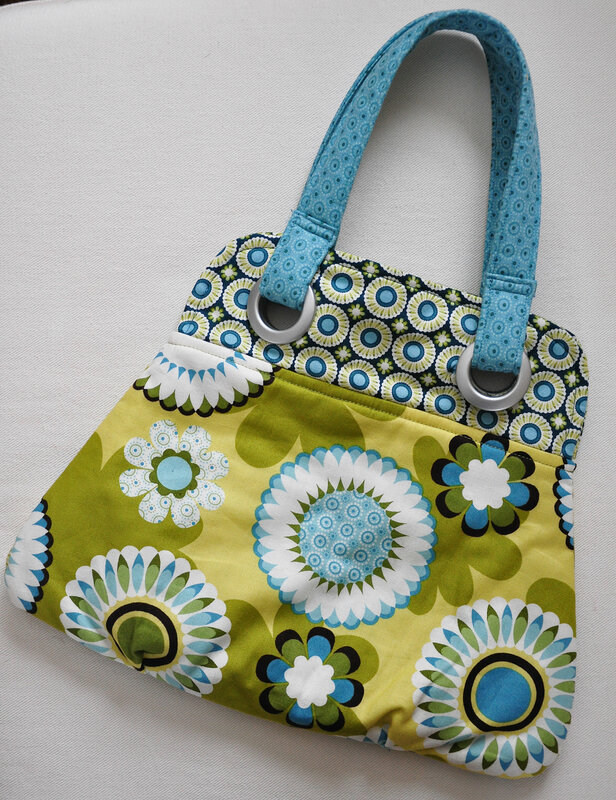 It’s made using my Wildflowers fabric. On this prototype, I decided that the bigger tucks helped, but that the fusible fleece wasn’t as permanent as I’d hoped. I started adding simple quilting, like straight lines or cross hatching. 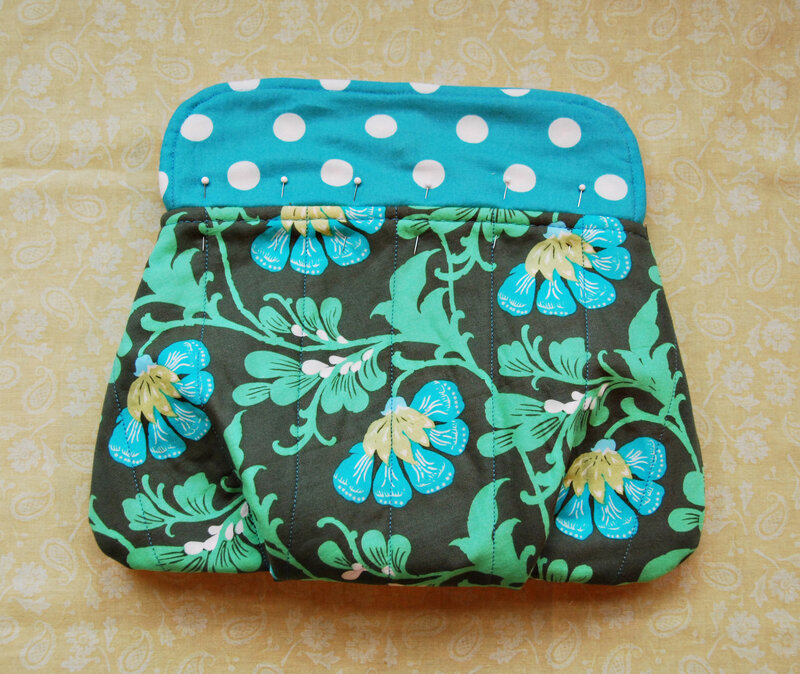 I found that it not only stabilized the fleece, but it gave a nicer, more finished look to the bag. This picture shows that simple quilting, and the fact that I haven’t finished this one yet! 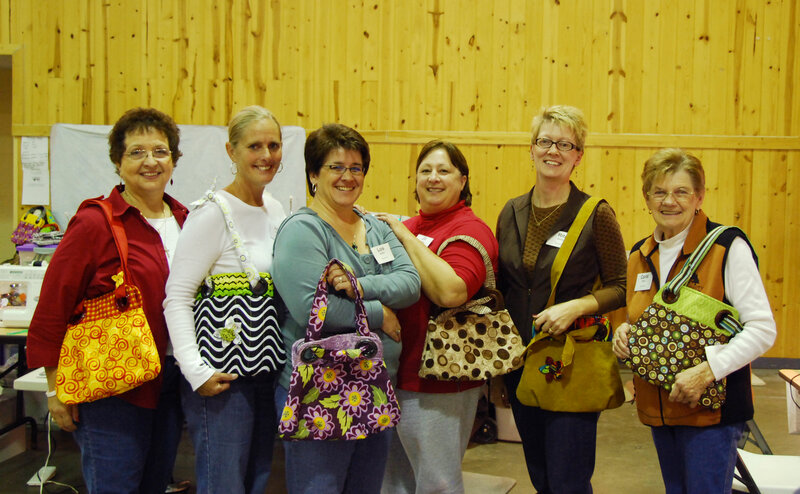 I picked up lots of helpful hints from the gals and it was really fun to see all the different fabric combinations. Each and every one looked different! Then the final test was having my Mom make the bag. She still found a few helpful hints for me! Very good ones, I might add, and I now felt ready to publish the pattern. So there you have it! 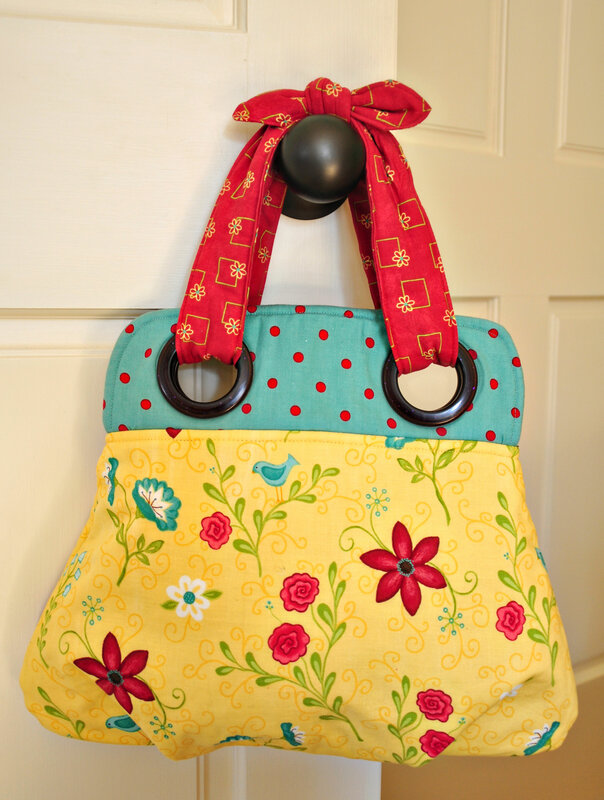 After lots of tweaks – The Bella Bag! It’s Palmer Printing’s van delivering a new book! 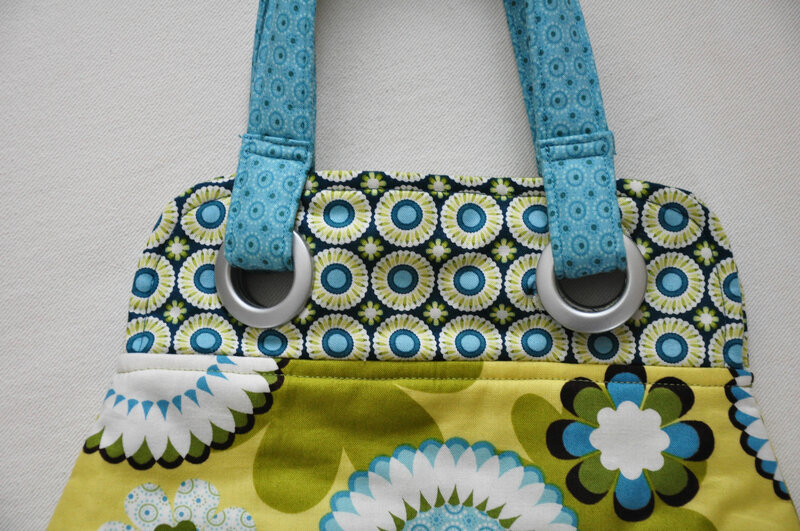 This entry was posted in Quilting and tagged dritz home grommets, grommets, lake beauty bible camp retreats, pattern testing, The Bella Bag. Bookmark the permalink. 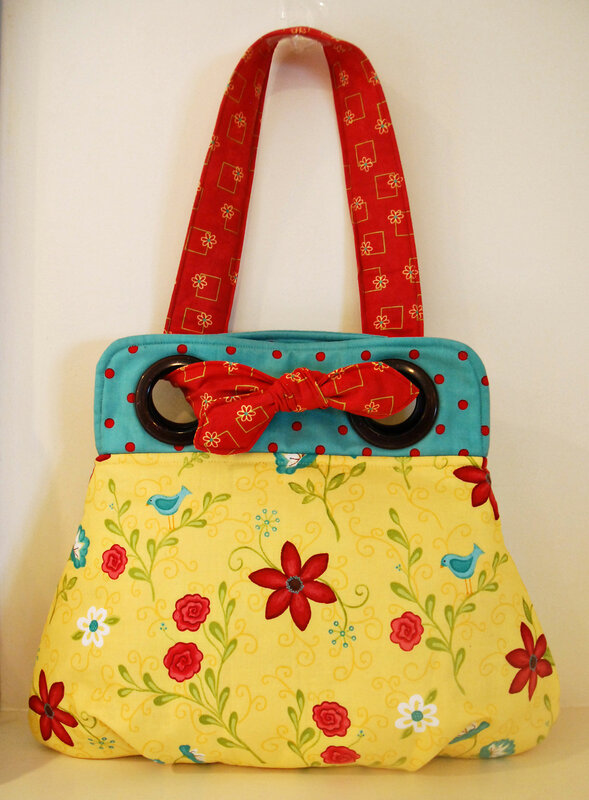 Heather, thank you for all the fun photos of your new bag – it’s just too cute. 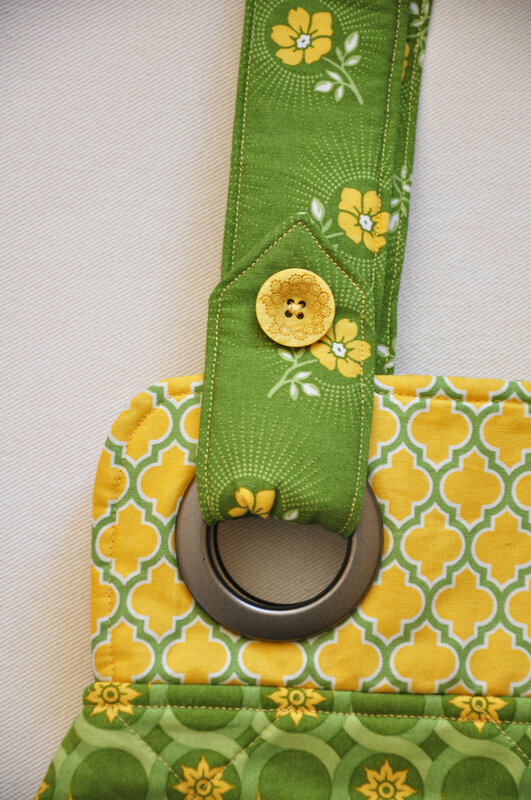 I love the idea of showing off a fun button – or having the handle tied into a bow – showing off even more “fun”. Oh I can’t wait for the pattern to be available! I LOVE that bag!!! 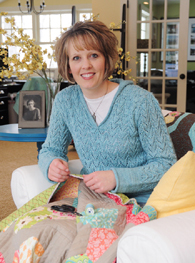 Congrats to your winners and how fun to see all those quilters showing off their delightful workmanship thanks to you! Congratulations to the winners! I look foward to seeing this pattern in the stores. 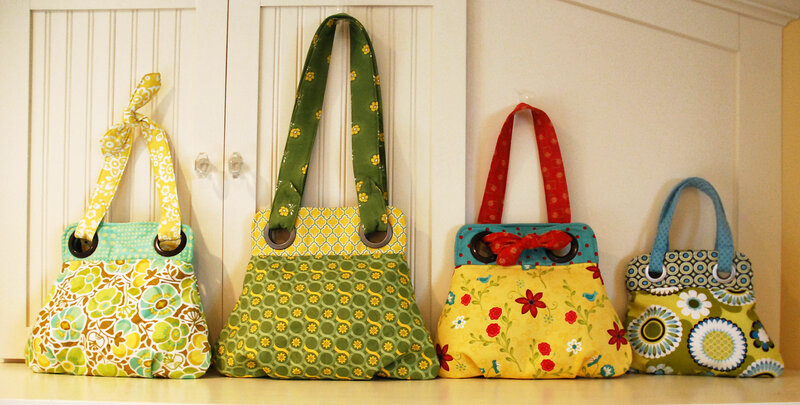 It will be my introduction to bag making and now I have to search out some grommet sales! Thanks for the peek into the design process. Goes to show just how much work goes into bringing an idea to life. I know! I know! I know! I want one! Love that bag! It’s just so pretty! congrats to the winners and I can’t wait til this pattern is available. Perfect gifts, if I could stand to give them away! OOHHH I hope it’s what I think it is in the boxes. A new book…can’t wait. I just picked up On the Run and love it. I can’t wait to make a few tablerunners. Great post showing and telling us how Bella progressed. Looking forward to seeing what the printer brougt to you! OK, love that bag! Will you let us know when we should be able to find it for purchase? please? Congratulations to Ashley, Kate, and Kiki. Interesting pictures and comments on ‘developing’ a pattern. All the bags are great! I like the idea of the convertible handles bag. It changes it up a bit. Congratulations to the lucky winners! 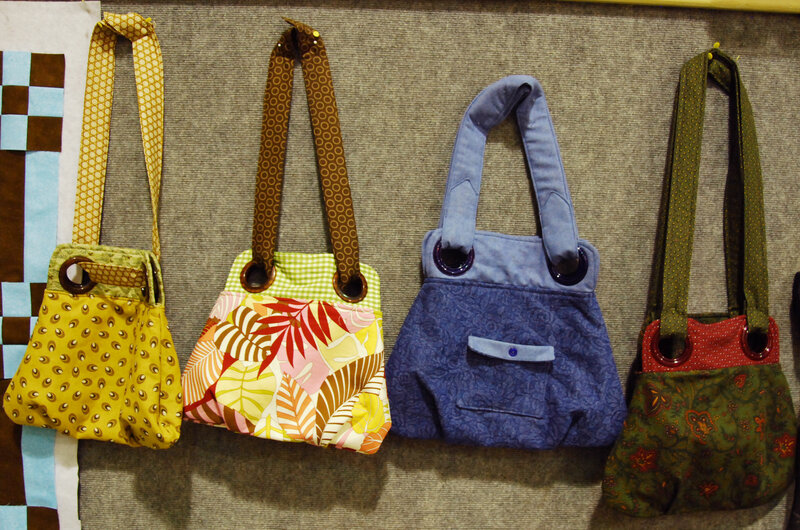 That is one great bag pattern Heather. New book is in – yay!! Congrats to the winners!! Thanks for the info on getting the grommets, and the process – what lucky ladies that got to help test drive!!! And – wowza, cant wait to see what that new book is!!!! 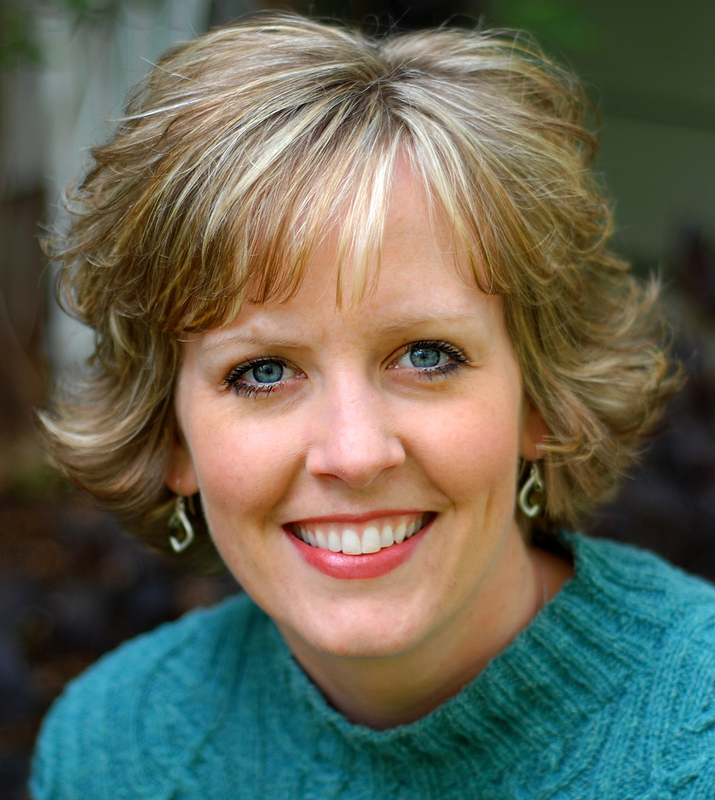 Heather I love your patterns and books…..they fly off my shelves. I have a question about the fabric used in the Touch of Class Tablecloth in your Livin’ Large pattern book. Is the fabric from your line, is it still available? The large print is so stunning, a lot of my customers drool over it and wonder if I can get it for them. What is that yellow and green moroccan tile looking fabric? I recognize it, but can’t place it. Thanks! When and where is the new book available? I really would love to give those bags a try. I have grommets that are dying to get used on something fun! Thanks for always coming up with great ideas! 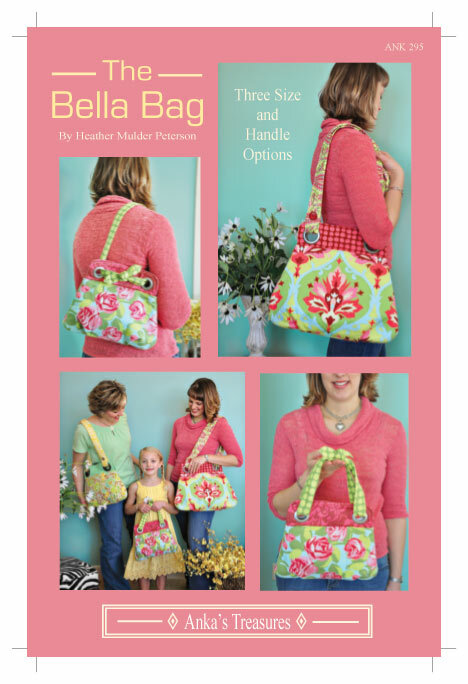 I recently purchased the Bella Bag pattern that you show and are in the process of making it. The ones shown make me see how important the right material is. All beautiful. the only disappointment I had is when I found out the cost of the grommets. Having to use 4 on a bag starts out with a higher expense than I wanted. Are there any alternatives? Love your site! Your quilting projects are super cute. I’m going to contact Dritz and see if they might ship 1 to me so I can finish my drapes! Wondering if this has ever happened to you?